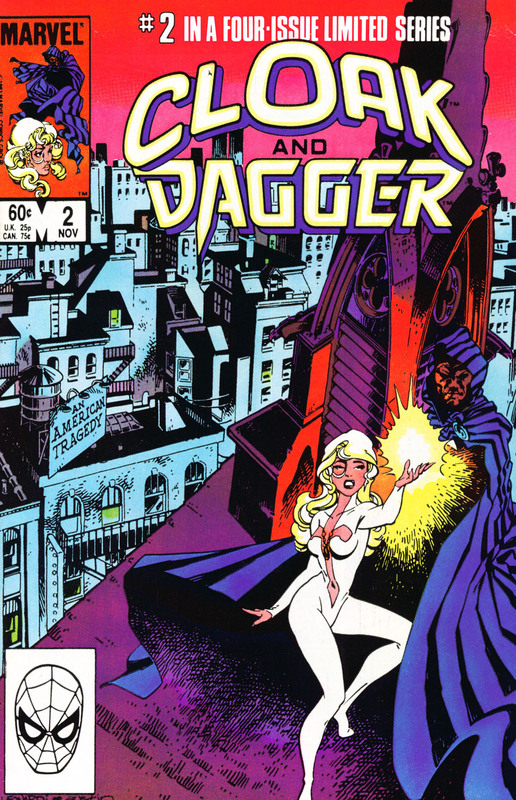 I've never been a fan of Cloak and Dagger for a couple of reasons. . .
First and foremost is that I'm generally not interested in "Gimmick" mainstream superheroes (meaning characters built around a single power and everything about that character is about that one thing. . .name, look, etc.) so I don't really seek out comics starring them. The second reason is pretty much the last part of the first. . .because I don't seek out "Gimmick" mainstream superheroes, I've read very little about Cloak and Dagger. Most of what I DO know about the characters comes from the few issues I have of "Strange Tales", a short-lived Doctor Strange/Cloak and Dagger split book Marvel put out in the 80's, and their small role in the recent "Secret Empire" story. But I've never been interested enough to go looking for more. I came across these four issues bundled at a local comic shop for five lousy bucks. Who am I to argue with 4 comics for 5 bucks? What TRUE lover of Longbox Junk can resist a deal like that? Not me. Let's do this! 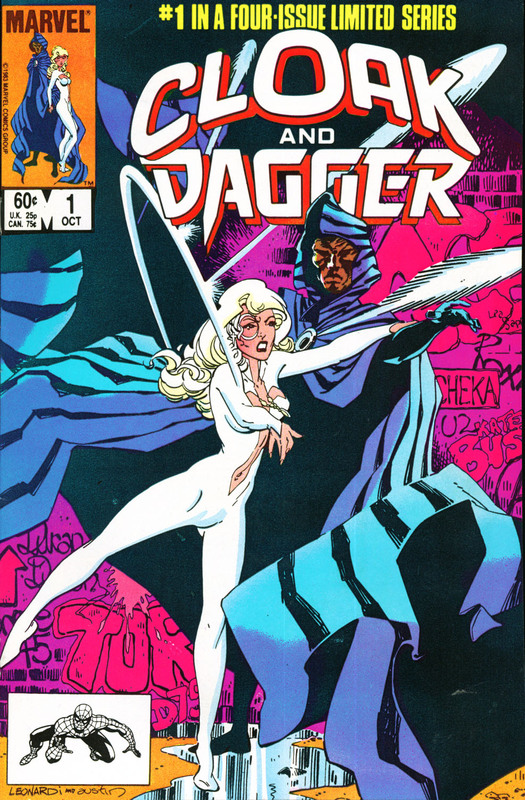 Mysterious teen vigilantes Cloak and Dagger come to Hell's Kitchen and begin to wage war on drug dealers and others who exploit the weak. Detective Brigid O'Reilly becomes involved when Cloak and Dagger unwittingly cause the death of an innocent during a battle gone wrong. This first issue comes out of the gate swinging with an engaging story that introduces all the players without being bogged down with exposition. . .a brief origin of Cloak and Dagger is nicely done on a single splash page. . . likewise, the other characters are introduced and the story moves along without delay at a brisk, extremely readable pace. But as nicely-done as the story is on this first issue, the art is the real star here. Rick Leonardi's detailed line work, combined with Terry Austin's heavy, dark inks make for a comic where each panel invites you to linger for a while. Overall, this is a fantastic first issue. It's mostly just putting the pieces on the board, but it's done in a way that makes you want to get right to the next issue. Detective O'Reilly reluctantly allows Cloak and Dagger help her track down a serial killer poisoning aspirin, but quickly discovers to her horror that Cloak and Dagger's idea of justice doesn't have anything to do with the law. This second issue starts to dig deep into the difference between justice and retribution. It's a surprisingly mature and somber story for a mainstream Marvel superhero comic, especially one from the early 80's. I liked it a lot because it was a bit unexpected for the story to dip down into the dark and filthy underbelly of human nature so quickly. Beyond the serial killer that is the main thrust of the story, there is also a surprisingly dark scene of Cloak confronting the pimp of a child prostitute, only for the girl to tell Cloak that she LIKES the life she's living. This ain't the Fantastic Four, folks. Speaking of the dark and gritty underbelly, the art on this series is a perfect match for the story. . .scenes of seedy neighborhoods and filthy alleyways are depicted with the kind of detail that makes me turn the pages slower than the brisk story wants me to. Overall, I found this second issue even more enjoyable than the first for its surprisingly dark and mature storytelling and fantastic artwork. DARK IS MY LOVE, AND DEADLY! Cloak finds himself losing the battle against the dark hunger within that feeds on the life energy of others, so he tries to flee from Dagger before he kills her. Dagger knows that if Cloak's hunger goes unchecked, he'll feed on innocent and guilty alike, so she continues to sustain him with more and more of her life force until she almost kills herself, ending up in the hospital with Cloak being her only hope of survival. This third issue slumps a bit as it delves into the parasitic relationship between Cloak and Dagger, but that's not to say it's bad, it's still a very well written look at the dark underbelly of superheroes and their relationship with the law. Aside from the main thrust of the story (Cloak's hunger almost draining Dagger of her life), Detective O'Reilly struggles with knowing the killer in the last issue deserved to die, but her allowing it was wrong. At the same time, Cloak also realizes that if he's going to retain some semblance of humanity, he can't just keep condemning criminals to feed his dark hunger, so he gives O'Reilly back the killer he's been feeding on. Like I said in my review of the second issue. . .this ain't Fantastic Four. This is a dark and sometimes uncomfortable look at the difference between justice and retribution. . .between what criminals deserve and what the law says should happen. Overall, there are a couple of scenes that bog the storytelling down a bit, making it less brisk than in previous issues, but this is still a surprisingly dark and mature take on superheroes. This final issue tells the tale of how rich, but unloved teenager Tandy Bowen and inner city youth Tyrone Johnson, wanted by the law for a crime he didn't commit, became the vigilante team of Cloak and Dagger after running away from home and then escaping an experiment where they were dosed with drugs that unlocked their latent powers. Actually, compared with the previous three issues, this origin story is pretty low-key. . .and to be honest, it feels a bit tacked on and somewhat forced. That's not to say it's bad. . .this final issue just feels out of place when taken as a whole with the rest of the series. Truthfully, Tandy and Tyrone's back stories really aren't that interesting, compared to what they became as a result. The art even takes a bit of a downward turn. . .not by much, but I can tell that the art team is much more comfortable in the dark, seedy alleyways of Hell's Kitchen than in the brightly-lit worlds of rich kid Tandy Bowen and promising basketball player Tyrone Johnson. Overall, this final issue wasn't bad by any means, but it's definitely the worst one of the series. There's no real explanation of WHY the two runaways got the powers that they did. . .that was all explained, retconned, and explained again in comics yet to come. . .so this wasn't really a great origin story when you get right down to it. 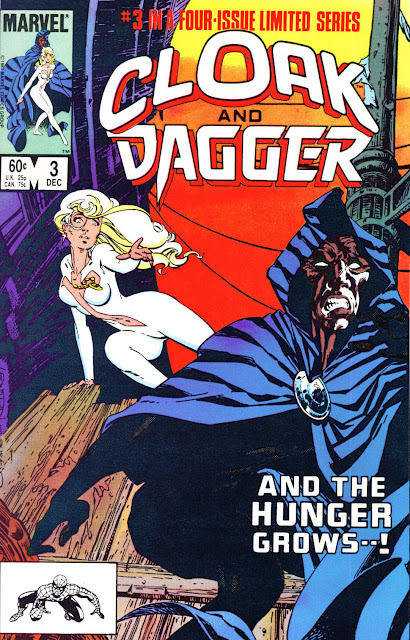 Overall, I found Cloak and Dagger to be a highly-enjoyable read with a surprisingly dark and mature story for a mainstream Marvel "gimmick" superhero team. The artwork was likewise dark and gritty and was a perfect match for the story at hand. 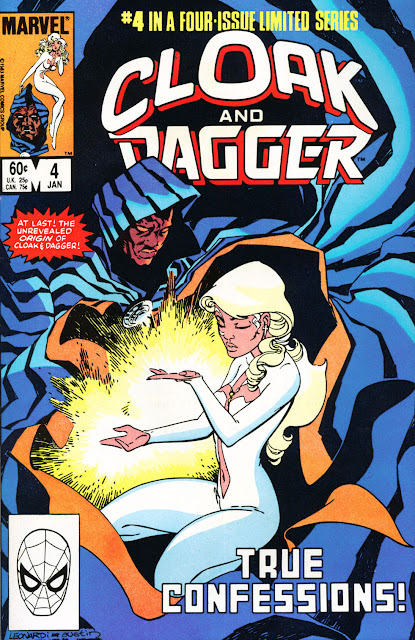 Unfortunately, the final issue. . .telling the origin of Cloak and Dagger. . .seemed out of place and of lower quality than the rest of the issues, honestly making this series seem more like a 3 issue mini with an origin issue thrown in. One other thing I noticed through these issues is that Tandy (Dagger) is pretty sexualized for being a character that is only 16 years old. I have a feeling that her costume alone would raise an eyebrow these days, let alone (off-panel) scenes of her being taken advantage of by an older man. There is a pretty constant undercurrent of Tandy's sexuality through the whole series. Nothing overt (except her costume), and it DOES sort of fit in with the dark and mature themes, but to a reader in 2019, it might come off as a bit uncomfortable seeing an underage character portrayed this way. Those issues aside, I was pleasantly surprised by this mini. I found it to be a nice little nugget of Longbox Junk gold panned from the river of crap that normally flows through the bargain boxes. I love Batman! I love Aliens! A Batman/Aliens crossover with art by the great Bernie Wrightson HAS to be good, right? Let's find out when I take a look at Dark Horse and DC's Batman /Aliens 2 issue mini. . .